Prateek Chaudhuri, a brilliant performer, is acclaimed as one of the most outstanding Sitar players of the country today amongst the present generation. His Sitar sparkles with the rare combination of virtuosity with technical finesse and a deep sense of aesthetics. His music also reflects the eternal essence of Sitar. Born in New Delhi, he has been groomed in a musical atmosphere since his birth. 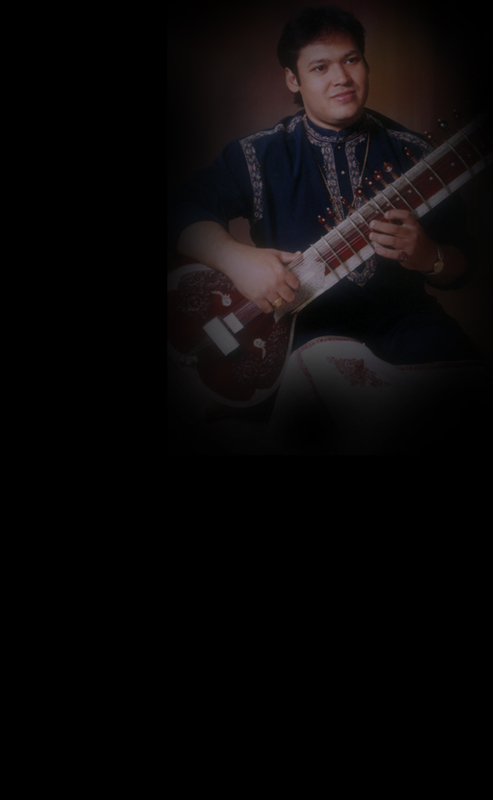 He has for his father, the World Renowned Sitar Maestro, Pandit Debu Chaudhuri, Padmabhushan Awardee. He also had the great fortune to learn from his Dadaguru (father’s guru), Ustad Mushtaq Ali Khan Sahab, the great legend of the “Senia” tradition, which has been named after “Mian Tansen” , the doyen of Indian Classical Music. Tansen is often called the father of Indian Classical Music and those who belong to his family and follow his tradition are called “ Senia ”. Prateek ji is the automatic successor to this rare “Senia” tradition of the great Indian Classical Music, having a unique tradition of playing the Sitar not only with the traditional and rare 17 frets ( instead of 19,20 or 21 frets, found at present), but also having a unique string arrangement of it’s own. Prateek ji, today, strides the musical panthenon like a young handsome Colossus. His graceful style and intricate technique echo the great masters of the past. From his nimble fingers resonate, the rich tones and melodious phrases, which are characteristics of his style. His skillful fingers handle rapidly moving passages with ease, while maintaining integrity and beauty of every note, the mark of a true virtuoso. With each performance, he evokes masterful handling of his instrument emitting grace, fluidity and dexterity with each note. His charming stage presence and charisma only serve to enhance the overall grandness of the performance. That being so, it must be mentioned that simplicity and clarity are the hallmark of his style. Amongst his numerous achievements, Prateek ji has been ranked as an “A Class” Artist by the National Television and Radio of the Govt. of India. His mastery over the Sitar and "Laya" (rhythm) has been acclaimed and praised by the leading musicians of the country and he has also been accompanied by almost all the leading Tabla maestros, in his recitals in India and Abroad. In his concerts and concert tours in India and Abroad, Prateek ji has been accompanied by almost all the leading Tabla Maestros of the country including the Late Ustad Shafaat Ahmed Khan, Pandit Kumar Bose, Pandit Anindo Chatterjee, Shri Bikram Ghosh, Ustad Akram Khan, Shri Sandeep Das, Ustad Rafiuddin Sabri and many other reputed players of the country. Prateek ji has been awarded the “Pandit Nikhil Bannerjee Award” from Lucknow, “The Best Instrumentalist Award” from Delhi and the “Surmani Award” from Mumbai, amongst many other Awards and recognitions. His name has also been listed amongst the prominent personalities of the World in American Biographies Intl., and Asia’s Who’s Who. Shri R. Venkataraman in Rashtrapati Bhawan, New Delhi. He has also performed for the Prime Minister of Norway during his trip to India in 2005. Prateek ji has performed at Major Venues across the world including the prestigious Carnegie Hall and Kennedy Centre, in USA and the famous Queen Elizabeth Hall in London. He also has to his credit many successful concerts in Major Music Festivals in India and Abroad. Prateek ji has also been the featured artist in almost all the Major Festivals of the country including the famous and prestigious Music Festivals like the Jaipur International Heritage Festival in Jaipur, UNESCO Music Festival on Intl. Day for Tolerance in Delhi, ITC Music Festival in Kolkata and Delhi, Tansen Music Festival in Gwalior and Delhi, Maihar Festival of Music in Maihar, Sawai Gandharva Music Festival in Poona, Saptak Festival in Ahmedabad, Baba Harballabh Festival in Jalandhar, Pandit Vishnu Digambar Jayanti in Delhi, UMAK Music Festival in Delhi, just to name a few, amongst many others. He is the only Indian musician to have performed with the Renowned “Swarovsky Music Wattens” Orchestra, consisting of 80 musicians, from Austria in a Special Concert held in Jaipur, India in the year 2005, which was highly appreciated and profusely praised by the audience. Prateek ji is the Creator and the Main Conductor of the “rare”, “unique”, and sought after Grand Musical Orchestral Ensemble of the country India – i.e “ SOUL OF INDIA -The Grand Orchestra ” which has got musical elements of great variety including Indian Classical, Western Classical. Rock music, Jazz music, Sufi music, Music from Rajasthan, Pop music, a Grand Rhythmic ensemble known as ‘Taal Vadya Kacheri’ and also other elements of World Music presented in a Grand scale. Prateek ji was invited to give a Special Live Concert for BBC 3 Radio in London. He has been featured in the prestigious National Programme of Music in All India Radio May’2000 and the National Television of India ( Doordarshan ) in 2003. Prateek ji has also been featured in the prestigious AIR Sangeet Sammelan (Radio Music Festival) of the Govt. of India, held in Shimla in 2004. Immensely popular Concerts : with Louis Banks,the Renowned Jazz Keyboard player and Sivamani, the famous Drummer and Percussionist from India. The name of the above group is “Rhythm Asia” which is very much sought after. World Music Fusion Group : Prateek ji has also recently formed a highly successful World Music Fusion Group of his own, which is also now very much sought after, wherein he is joined on the Sitar by his group of reputed Western and Indian musicians fusing the Sitar with Keyboard, Drums, Tabla and other instruments making it an affair to remember. He has also experimented successfully with Carnatic musicians in India which also show his imagination in another dimension in his musical career. Another unique and rare concert performed by him was that Prateek ji, on the Solo Sitar was accompanied by both Tabla and Mridangam, a highly successful and rare combination. Prateek ji has also recently given extremely successful and sought after Jugalbandi (Duet) Concerts with his father, Pandit Debu Chaudhuri, i.e. Duet Sitar Concerts and with many reputed artists of the country playing the unique instruments like the Shehnai, Sarangi and the Sarod. These concerts also had an overwhelming response and won the hearts of the audience. He has toured extensively throughout the world with his father as well as a solo artiste. These include countries like United States of America, Canada, England, France, Greece, Germany, Holland, Austria, Belgium, Japan, China, Italy, Hong Kong, Malaysia, Singapore, Mexico, Morocco, Denmark, Norway, Sweden, Switzerland, Yugoslavia (before partition), , Indonesia, Venezuela , just to name a few. Prateek ji is also the first Sitarist to visit and perform in countries like Bosnia (after partition of Yugoslavia) and even in Latin American countries like Columbia, Guatemala and Panama. Prateek ji has also excelled in each stage of his education. He is the recipient of the Gold Medal for his M.A. (Music), while he has also secured the first position in M.Phil (Music) examinations and is Ph.D (Music) i.e a Doctorate. from the University of Delhi. At present, he not only performs all over the world, but also teaches as a Reader (i.e. an Associate Professor) at the Faculty of Music of the University of Delhi, India, thus being a unique and rare combination of an eminent performer and teacher together in one , which is very hard to find. Besides his innumerous performances all over the world, Prateek ji has also conducted several workshops and also given several lecture-demonstrations in India and Abroad for students and musicians in many countries. He has recorded for many labels including India Archives in New York, USA and also with SaReGaMa, India. Awarded the Delhi State Scholarship for Music by the Govt. of the State of Delhi. Recipient of the Junior Research Fellowship and Senior Research Fellowship awarded by the University Grants Commission, Govt. of India for Research in Music. Represented India in the Six Nation Music Festival in Greece.